Companies with a strong commitment to diversity tend to be more profitable in relation to comparable firms in their industry. A study conducted by the Kelley School of Business at Indiana University selected 50 firms with a stated commitment to employee diversity and compared their performance to that of their peers*. The results showed that the Diversity 50 firms realized a 29% higher net profit margin, on average, when compared to their matched firms. 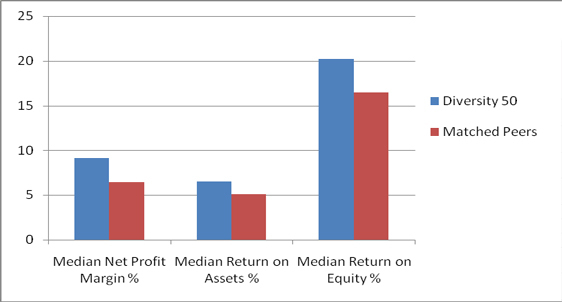 Diversity 50 firms also performed better on average than their peers in return on assets (22%) and return on equity (19%).